Wednesday 10 June, 8 pm: UK premiere of documentary (60 mins) by Dan Shadur and Barak Heymann (2013 – Hebrew with English subtitles). It seems almost unimaginable today under the Ayatollahs’ regime, but during the 60’s and 70’s Israel enjoyed good, if understated, relations with Iran. El Al flew from Tel Aviv. Thousands of Israelis lived a comfortable lifestyle in Tehran. They were diplomats, Mossad agents, engineers building dams and infrastructure, and military advisers to the Shah’s army. Then in 1979, paradise turned to hell. 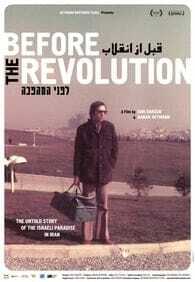 The Israeli community, like the prosperous and westernised middle classes, were caught unawares by the Islamist revolution of 1979. This thrilling documentary tells of their experiences, and how they were forced to make snap decisions to save themselves and their families from the impending storm. Jews who lived in Iran are invited to contribute their personal stories in the discussion to follow. Hampstead Garden Suburb synagogue, Norrice Lea, London N2 0RE. Tickets £10 from Spiro Ark, email education@spiroark.org or ring : 0207 794 4655 or Harif: Email info@harif.org or ring 07506033848.